The owner is happy, the players are happy, the fans are happy. 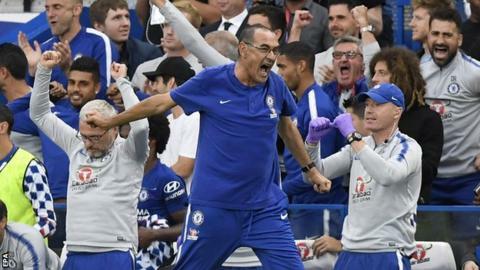 Maurizio Sarri may only be six league games into his Chelsea tenure - and faces his biggest challenge yet when his side meet leaders Liverpool on Saturday - but he has already achieved a level of harmony at Stamford Bridge that was clearly lacking last season. From putting treats on the menu to embracing players' opinions and transforming their style of play, it has been a cultural revolution implemented in double-quick time. So what exactly is different at Chelsea this season? And how has Sarri gone about making those changes? Sarri, along with former Borussia Dortmund and Barcelona coaches Thomas Tuchel and Luis Enrique, were the men in contention to succeed Antonio Conte - but the Italian's work and style at Napoli swiftly made him Chelsea's prime target. Chain-smoking, notoriously superstitious and a former banker who did not enter management until he was 40, Sarri's feats in his home city, where he was treated with reverence, brought lavish praise from his peers. Arrigo Sacchi, twice a European Cup winner at AC Milan, described him as "a genius", while Manchester City's Pep Guardiola declared he was "in love with Napoli" after watching his side. The trio shared dinner in Italy in the summer as Sarri plotted his next move after taking Napoli to within four points of champions Juventus in Serie A.
Sarri's coaching career has been a slow burner but his rise to prominence has been rapid. Just four years ago he was coaching unfashionable Empoli but performed with such distinction in Naples that he was Serie A coach of the year in 2017. Chelsea owner Roman Abramovich's eye was caught by Sarri's methods and attractive playing style. He did not have a trophy to his name but this was not a concern for the Russian as he was convinced this was a coach who had proved his worth. Sarri's personality means he is less likely to become involved in the tensions that led to unrest last season, resulting in Conte's departure. Those close to him believe he is happiest putting his imprint on his squad, at ease working with players on the training ground and that will be his main focus. He will have his transfer targets in mind - but will not be as rigid as Conte, who could become discontented when his number-one target was not acquired. Sarri is not regarded as overdemanding on transfer matters. Chelsea have backed Sarri with the arrival of one of his key Napoli cohorts, Jorginho snatched away from Manchester City in a £50m deal, as well as by spending a world record £71m on Athletic Bilbao goalkeeper Kepa Arrizabalaga to replace Thibaut Courtois. Sarri, seen by those around the club as a gregarious, tactile and humorous man, has established a good early relationship with Abramovich and key director Marina Granovskaia, who is his day-to-day point of contact. The club ensured Sarri acted quickly on his appointment to clear up controversy over criticism he received for sexist and homophobic remarks he made while in Italy - and since then he has made an instant impact at Chelsea and on the Premier League. Sarri loves politics, with a personal leaning to the left, and likes to indulge his love of cinema, reading poetry and books - but they have been set to one side as he focuses his sights on moulding the Blues in his style. Sarri is one of management's more rounded individuals, provided in part by his background as a currency trader, but he is currently obsessed with the re-evaluation of Chelsea. The Italian has been spending up to 14 hours at Chelsea's Cobham training base virtually every day since his arrival, testimony to his meticulous approach and eye for detail. Italian journalist Stefano Boldrini, London correspondent for Italian daily Gazzetta dello Sport, told BBC Sport: "If Conte is 24 hours a day, Sarri is 48 hours a day. "In the first two months at Chelsea he spends 10 to 14 hours every day between the technical ground at the computer or TV watching other teams because the English league is a big fight for him." Sarri has a more collective approach to management than his fiery predecessor, with Boldrini saying: "With Conte it is a vertical structure. He is the boss and there is only one boss. Sarri is open. He speaks every day with his assistants and at the end he decides. He is open, talking with the players. "Conte says: 'I am the boss, I decide.' Sarri will say: 'I am the boss but I will discuss with you.' Sometimes Conte's style may be better with different personalities. Sarri is a different culture, another story." Much was made of Conte's dictatorial style at Chelsea last season and the tensions which arose as a result, with Willian one player who publicly admitted he would have left had he stayed. Sarri's man-management skills have already made Cobham a more relaxed place and he is always willing to engage with various strands of the club - but he is not a fan of anything that keeps him away from the training pitch or the complex where he works behind the scenes. He has already earned a reputation inside Chelsea as a manager who attacks his task in minute detail and, while he does canvas opinion from his trusted team, in truth he is the sole strategist. Chelsea icon Gianfranco Zola, back as assistant manager, is also vocal - but it is Sarri running the show on the training ground. He has also made adjustments away from the training pitch that have won favour within Chelsea's powerful dressing room. When Chelsea's players walked into a side room at an Austrian motel in July 2016 and found themselves confronted by a selection of seeds, nuts and dried fruit, many assumed they had simply taken a wrong turn. It was, in fact, the first sign of the dietary iron discipline Conte wanted to enforce on his Blues squad - and who can question the results with a Premier League title and an FA Cup in his two seasons at Stamford Bridge? Sarri, however, is a different beast. Discipline is high on his agenda but the rules are now relaxed and Cobham has seen some of the more austere aspects of life lifted after regime change. Sarri's big message is that Cobham must be a place players want to come to work - serious, but also fun. And the lighter touches can even be found on the dining tables, with the return of "luxuries" such as ketchup, salt and butter. Chefs now even prepare cakes for the players to enjoy and on away trips Chelsea's players often have cartons of ice cream placed in a bowl. Sarri trusts his players not to over-indulge and will act if they do - and it is an attitude that now extends beyond the training ground. In recent years, not just under Conte, Chelsea players often met at Stamford Bridge to go to a team hotel the night before home games, retiring to their rooms after dinner and a team meeting. The following morning brought a walk and a stretch around Chelsea Harbour but there was an element of "dead time" that often led to frustration. Sarri has changed that routine and now trusts his players with nights at home with their families before home games, a quick win for the Italian and one guaranteed to gain approval from his players. The results have been a much happier Chelsea camp this season, reflected in their impressive start to the Premier League season, where they are unbeaten in their first six games. They also reached the Carabao Cup fourth round on Wednesday by coming from behind to beat Liverpool. Liverpool manager Jurgen Klopp is another peer prepared to express his admiration for Sarri's work, describing his transformation as "the biggest change in style I have ever seen in such a short space of time. Wow. Style completely changed. What a manager he is". So what has Sarri actually done to bring such admiration from a man also regarded as one of the world's elite coaches? Sarri's preferred style of 4-3-3 carries more risk than Conte's 3-4-3 but he wants to reap the rewards and a look at the stats shows just how that transformation is playing out and how "Sarri-ball" is beginning to emerge in west London. While formation is key, it is another fundamentally simple tweak that is making a difference - his players' physical positions on the pitch. Sarri has moved Chelsea's play further up the field this season by more than three metres. Last season, on average, they started sequences of possession 40.9m from their own goal, the eighth best record in the division. In 2018-19 their passages of play start from 44.1m, second behind Manchester City. Helped by that more advanced positioning, Chelsea are only allowing the opposition to advance an average of 10.13m with the ball before attempting to make a defensive intervention. This is the best figure in the Premier League, whereas last term they were eighth, behind clubs including Bournemouth, Southampton and Watford, allowing 12.8m of progress. "I prefer to defend as far as possible up the pitch," said Cesar Azpilicueta, who has been at the club for six years. "It's different. You can see we press very high and the defensive line is very high, but that's what we want. "It helps that he tells you very clearly what he wants and we analyse every game to see where we can improve. Defensively he says we want to be looking at the ball the whole time, high pressing. We're all working in training to get it as good as possible." Another marked change has been the way Chelsea keep the ball, highlighted against West Ham by the statistic that Jorginho attempted 180 passes, more than any other players in a Premier League game since Opta began recording that data. It is certainly true that Sarri's side keep possession for longer and employ a less direct style this season. In 2017-18, Chelsea completed sequences of 10 or more passes 14 times per game on average. This season the figure stands at 25 times per game. And their total of 147 sequences of 10 passes or more is just two short of Manchester City, who have the highest figure, and more than double Arsenal's. Chelsea's match-winner at Liverpool Eden Hazard, who Sarri held back from starting until he hit full match fitness, says: "I like to have the ball, not in my own half but in the last 30 metres. I like that type of game. It is completely different from Antonio Conte or Jose Mourinho before." Can Sarri bring success to Chelsea? Chelsea do not set managers pre-ordained targets. The goal is simply to ensure they are in contention for major prizes and the Champions League towards the end of the season. Sarri's arrival at Chelsea, a club which history proves is demanding on many levels, caused some surprise in Italy but he follows in the line of fellow countrymen such as Gianluca Vialli, Claudio Ranieri, Roberto di Matteo and Antonio Conte. Boldrini says: "At the beginning a lot of people thought it would not be easy for him because Chelsea is not an easy club. It demands a lot but now after two months of work people think it may be better and he could win." The meeting with Liverpool at Stamford Bridge on Saturday will tell us more about how much early progress Chelsea have made under their latest Italian manager - and how much more needs to be done. Spurs better, Man Utd going backwards: How is your team doing compared with last season? Read more on Spurs better, Man Utd going backwards: How is your team doing compared with last season?